Converse sneakers and knee-high boots are my main footwear options. I have several of each and they seem to go with everything I own. Which also means it is important to me to take care of my sneakers and boots so they last. 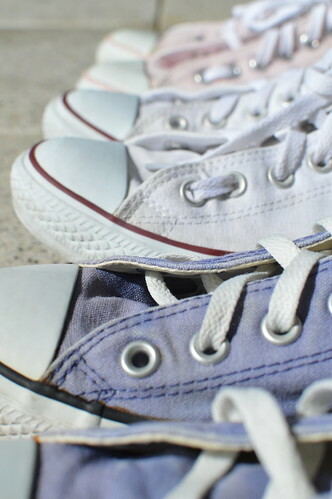 Shoe conditioner and polish work wonders on leather boots, but we all know the challenge of keeping canvas sneakers clean so this post addresses how I do that with great success in spite of having two kids, one of whom literally stands on my shoes every chance he gets. 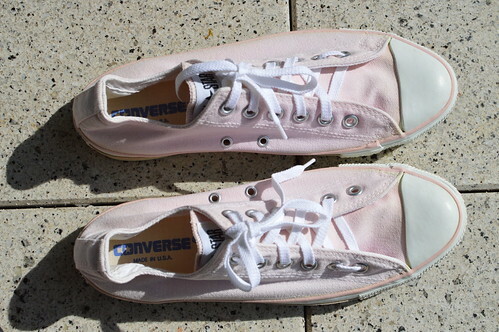 My white Converse sneakers were bought in June 2015 in time for a week-long visit to Madrid. I wore them every day all over the city then wore them the rest of the summer back here in Cork and to work and play and so on. They are my Go To shoes in the summer, though they got less use last summer because they were hard to reach the laces to tie when I was in the final 12 weeks of my pregnancy. 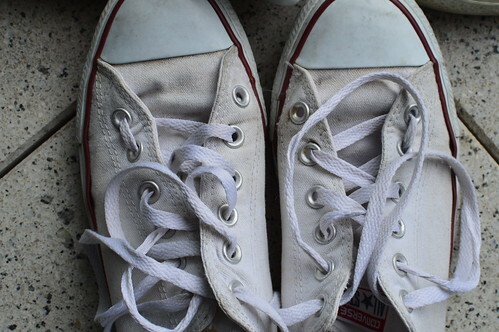 About once a year, when their dirtiness starts to be noticeable, I clean white Converse sneakers. 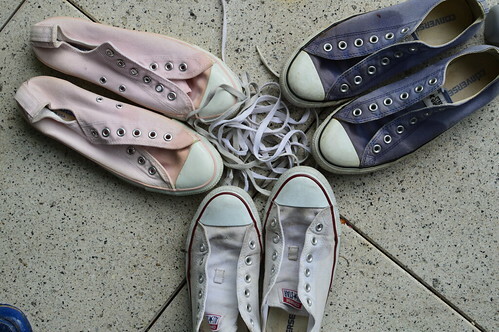 This year, I had two other pair of Converse I dug out of the depths of my closet this Spring, so we can see how the process works for different colors. 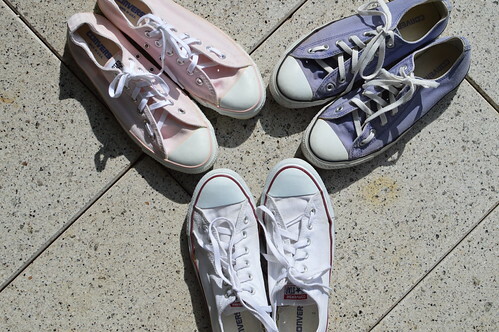 Aside from the white pair, there is a pale pink pair and a periwinkle blue pair. 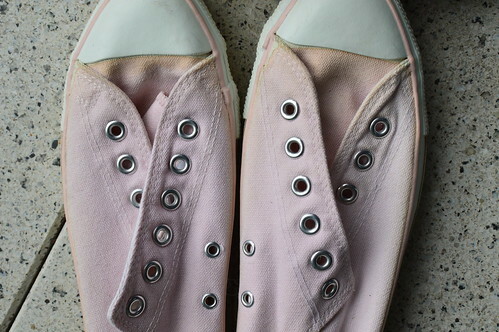 It should be noted that the pink pair of Converse were bought at a shoe outlet in Pennsylvania in April 1998, so they have yellowing from age more than staining. I must have used Scotchguard when I initially bought them because they are very clean for their 19.5 years of use. 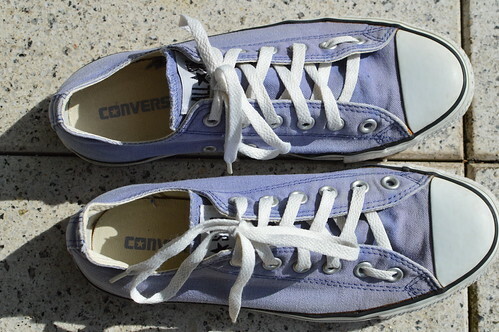 I can’t really remember when I bought the periwinkle pair, but I’m thinking it was around 2005–2008. 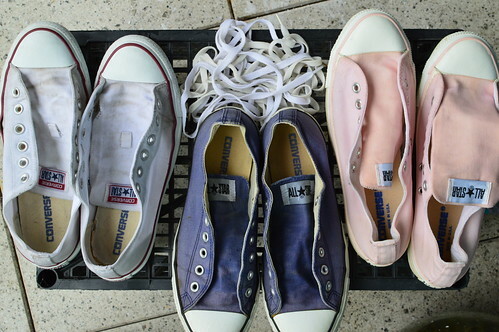 So, the shoes range in age, but the white ones show dirt and stains more than the other two. You know how it goes. Here are the shoes BEFORE. All before and after photos are taken in the same location at about the same time of day in about the same overcast light. There are a few after photos taken in full sun because for about 30 seconds there were no clouds. But I was careful to seek out the same lighting to have an accurate comparison. Check out this blackberry stain on the inside ankle area of the laced periwinkle sneaker from picking berries in West Cork in 2009. 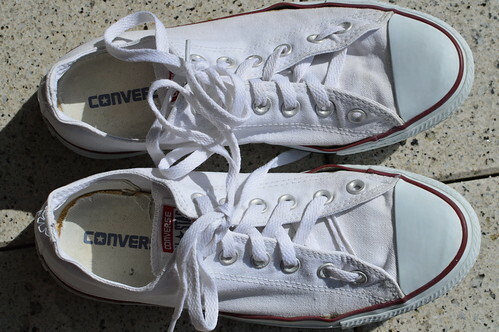 Before going into how I clean white Converse, I want to discuss quick clean or touch-up approaches, specifically maintaining the white toe cap that the shoes are known for. I have read posts which I’ve found through Pinterest about using nail polish remover to clean the white toe cap, but I can’t bear to try it because acetone itself strips the sheen off things like plastic and I fear whatever factory-added protectant the toe cap was given will be stripped away, so I stick to baby wipes or a little soap and water on a washcloth. 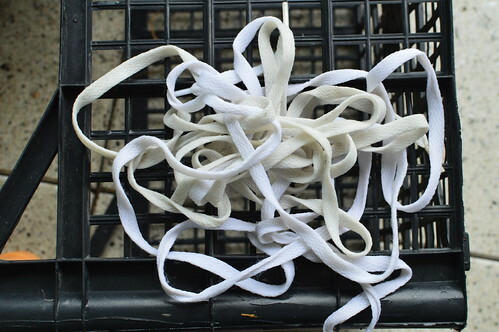 Before cleaning, remove the shoelaces and set aside. These will be added to the remaining Oxy mixture bowl after the bulk of it is applied to the shoes. I take 1 cup OxyClean or related powder and 1.3 cups of boiling hot water and put them together in a medium bowl. The combination should bubble and fizz enough it risks overflowing the bowl, so a larger bowl avoids that. Give it a stir to make sure it is a paste-like texture and is not separated with the Oxy powder just lumped at the bottom of the bowl. 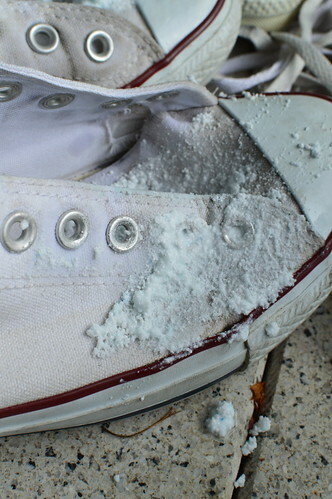 I then take a little scrubber to apply the Oxy mixture to each external element of the shoe. Alternatively, you can put the mixture into a glass (like Pyrex) baking dish (like for lasagna or brownies) or rubber bucket and place the shoes upside down in the Oxy mixture. If you choose to use the upside-down soak method (shown below), you will need more Oxy mixture. Either way, soak the laces in the dish or bowl (it’s ok if you need to add more boiling water to the bowl to cover the laces). 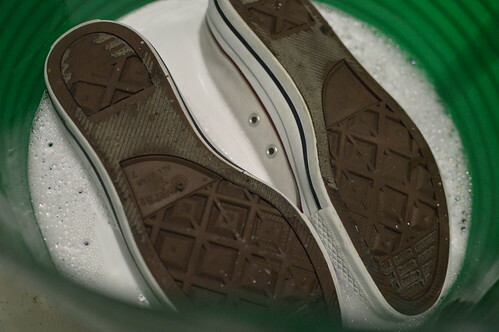 Soaking is a less time consuming approach and works just as well, but I was cleaning three shoes at once. So, the scrub approach was how I did it this time. 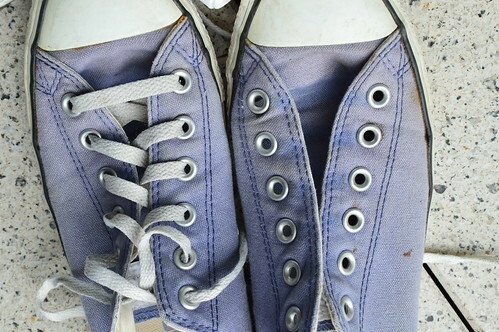 Leave the shoes and laces for at least an hour or overnight with the Oxy mixture fighting those pesky stains. Then hand wash them in a bucket tub filled with lukewarm water with mild detergent and a 1/4 cup of white distilled vinegar to remove the Oxy mixture and wash the shoes. Then give them a good rinse under a sink faucet to remove any residue. Place the shoes in a place with good circulation or wherever you have that is best for drying laundry and things (the hot press is ideal). Here are photos of them clean, wet, and starting to air-dry. Overnight, I put them upside down on a milk crate with the tongues flipped over the side for optimum air circulation and water drainage. Then in the morning, I flipped them over to finish the drying off. Once dry, wear as usual. 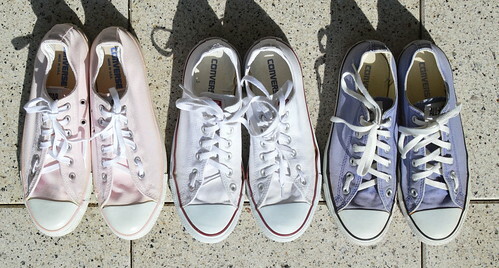 Well, maybe you will have less fear for a little dust or dirt, knowing you can clean white Converse in a day. Sure, they are not the same brightness as when they were brand new, but they are crisp and cheerful once again to face what lays ahead. Ok, one final BEFORE then I’ll show you the AFTER so you do not have to scroll back up to the top. 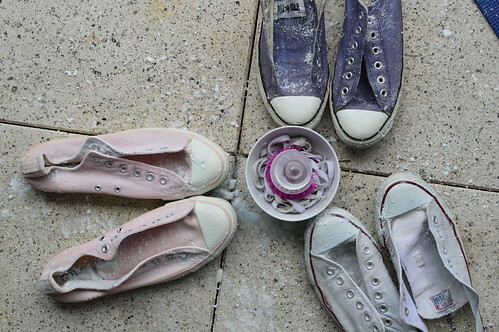 Here are the sneakers AFTER this process and air-drying for 24 hours. 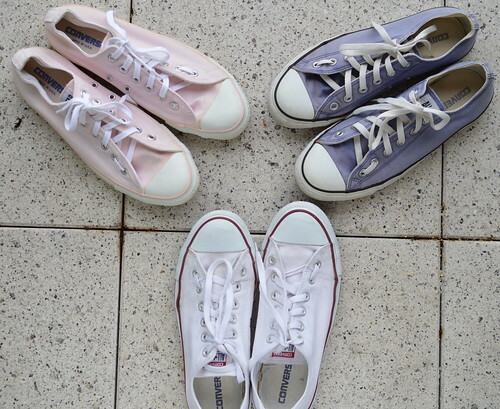 I bought new laces for the pink ones because those were lost. And the clouds parted to shine upon the clean shoes. The pink pair still has a little yellowing beside the rubber from age, but better overall and the new laces are so cheerful. You’d never guess these shoes have been mine for 19 years. 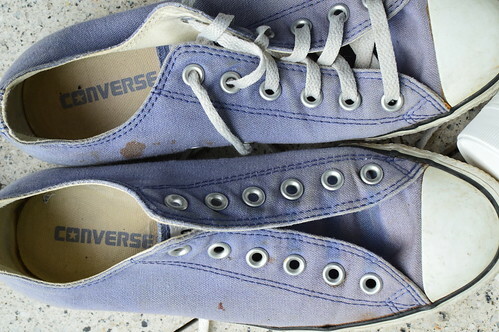 There were nine-year-old blackberry stains on the periwinkle pair that even were lifted! I had no hope of those spots going away, yet they did. And check out those white toe caps. It is a simple process, but makes a huge difference. 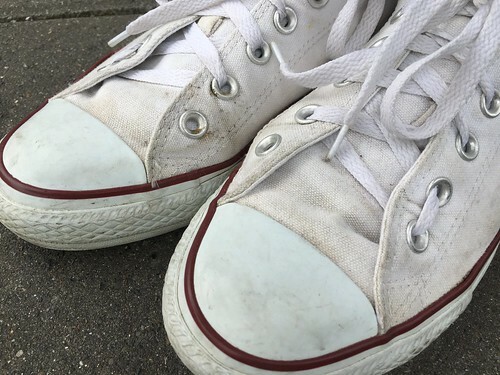 After the first summer wearing my white Converse sneakers (two years ago), I thought for sure I would need to replace them – they were THAT dirty! But this gave them renewed spirit, ok it just made them bright again. You may have noticed I lace my sneakers up in a different way. This is specifically helpful relieve pressure on bunions. I have experienced less foot pain and fatigue from bunion pain since employing this lacing technique. 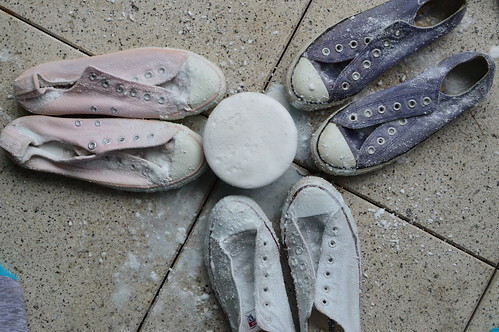 Have you tried this or another approach to cleaning Converse sneakers? How did it work for you? Am I weird to feel like cleaning my sneakers is a superpower? This entry was posted in Make Do and Mend, Tutorials | Patterns and tagged cleaning, DIY.